Range: Maine and New Hampshire to Pennsylvania and Georgia. 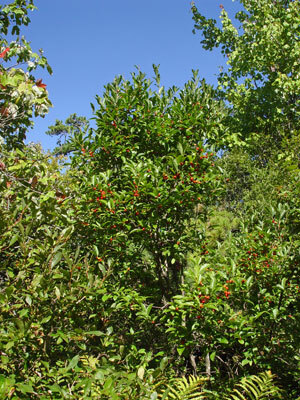 Aids to Identification: Smooth winterberry holly is a deciduous shrub which resembles the closely related common winterberry (Ilex verticillata) found throughout Maine. 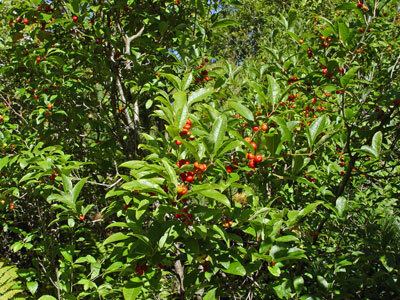 It grows up to 4 m high, with oval leaves which are finely toothed along the edges and shiny on their upper surface (the common winterberry has dull leaves). There are separate male and female flowers, usually on separate plants, in the leaf axils. The staminate flowers occur singly or two together and are borne on long stalks, while the pistillate flowers are solitary and on shorter stalks. The ovule-bearing carpellate flowers develop into small, red berries. 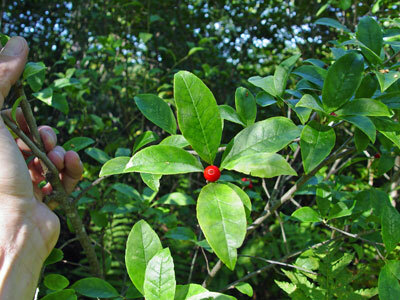 It is very similar to, and can occur near, the common winterberry (Ilex verticillata), but can be distinguished by the entire sepal margins (ciliate in Ilex verticillata). Ecological characteristics: Known in southern Maine from swamps and thickets both along the coast and inland. Phenology: Flowers May - June, berries appear in early June. Known Distribution in Maine: This rare plant has been documented from a total of 22 town(s) in the following county(ies): Androscoggin, Cumberland, Lincoln, Oxford, York. Reason(s) for rarity: At northern limit of its range. 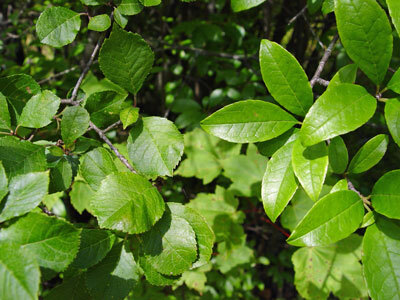 Conservation considerations: This plant is restricted statewide to southern Maine. Some populations are vulnerable to conversion of their habitat to residential or commercial use; other populations, located farther within larger wetlands, are more secure.